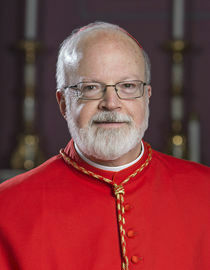 Cardinal Sean P. O'Malley delivers the homily at the March for Life Vigil Mass celebrated at the Basilica of the immaculate Conception in Washignton D.C. Jan. 21, 2015. Pilot photo/Gregory L. Tracy. There is a popular diner near the Cathedral of the Holy Cross. One of the items on the menu is called "The Emergency Room" consisting of bacon, sausages, eggs, pancakes, french toast, hash browns. The clientele are people from the hood, a few Archie and Edith Bunkers, Ralph and Alice Kramdens, cops and priests. It's the kind of place you could invite Pope Francis to. Juke box music from the 50's and 60's adds to the atmosphere. While having dinner there last week with Fr. O'Leary and Fr. Kickham, the phone rang. I presumed it was a telemarketer. It was Oprah Winfrey. I almost had to order "the emergency room". She called to tell me she was reading cardinalseansblog.org and wanted to thank me for the comments I had published on the blog. We are called upon to build a better world. "The Church's social thought", says Pope Francis, "offers proposals, works for change and constantly points to the hope born of the loving heart of Jesus Christ." Recently, addressing a group of Catholic doctors in Rome, the Holy Father, Pope Francis stated: "If the Hippocratic Oath commits you to always be servants of life, the Gospel pushes you further: to love life no matter what, especially when it is in need of special care and attention. The Holy Father warns the health care workers that "The dominant thinking sometimes suggests a 'false compassion,' that which believes that it is helpful to women to promote abortion; and act of dignity to obtain euthanasia; a scientific breakthrough to 'produce' a child and to consider it to be a right rather than a gift to welcome.